Chinese business continues to have incredible gains in world commerce. 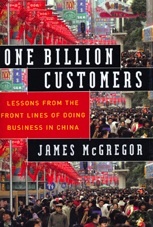 Chinese companies inhale best practices from around the globe. Six Sigma and ISO-9000 management principles are as deeply ingrained in the minds of Chinese managers now as were the slogans in Mao’s Little Red Book in their childhoods. The world’s multinationals have poured into China to build world-class facilities that are critical parts of their global supply and R&D chains. China has taken enormous steps to open its markets widely since joining the World Trade Organization. Foreign companies aren’t hesitating to move in where they can and gobble up market share and Chinese-owned companies. While serveral hundred million people have been pulled from extreme poverty in the past three decades, the gap between rich and poor is getting larger and larger. The richest 10 percent of Chinese families now possess 40 percent of the country’s private assets while the poorest 10 percent own only 2 percent. The average annual income of a Beijing resident is $2,263, while a farmer in Qinghai earns $277 annually. Rich and poor in China now share the world’s dirtiest country. You can taste the putrid air in much of China, which is now home to sixteen of the world’s most polluted cities, and the rivers and lakes are colored in rainbow hues from industrial effluent. 30 years ago, China was number 137 on the GDP list – just slightly ahead of Malawi. Today, China has the second largest GDP in the world. In the following video CNN’s Maria Bartoromeo interviews John and Doris Naisbitt about China’s booming economy and how it has fared during the most recent economic crisis. IS THIS ECONOMIC GROWTH TREND SUSTAINABLE? David Dollar suggests that the prospects for China’s continued growth are good for the next decade or so. However, as the labor force shrinks due to China’s One Child Policy and environmental degradation continues as China maintains focus on Economy over Environment, China will face issues for sustainable economic growth. Jack Perkowski suggests that China’s Leadership is clearly aware of the challenge of getting the remaining 900 million poor people up the income ladder as quickly as possible to avoid the unrest that could emerge from economic disparity. 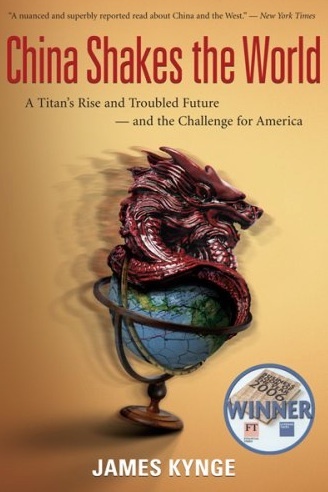 In his book, China Shakes the World, James Kynge suggests that Environmental Degradation is an important negative consequence of China’s rapid economic growth and the corrupt practices of local governments. As only he can, Tom Stewart succinctly summarizes the very delicate balance that China’s Leadership is dealing with as it strives to maintain sustainable economic growth. Will social unrest explode in China as a result of the increasing disparity between the rich and poor? Do the Chinese believe that the 30 year trend of 10% growth per year is economically and enviornmentally sustainable? Do the Chinese believe that the Government should take a more balanced approach in driving economic growth while moderating environmental degradation? Are the Chinese concerned about their ability to continue to access natural resources to fuel their growth? How might their “No Strings Attached” policies in dealing with trading partners create negative unanticipated outcomes for the country? Despite India’s significant rise in overall economic status in the world, more than a quarter of Indians (300 Milllion people) still live below the absolute poverty line of $1/day. The contrasts between rich and poor are perhaps more striking today as they have ever been. In thriving urban areas such as Delhi, are experiencing what Edward Luce calls “Affluenza.” Today, one in five children in Delhi is obese while in the country as a whole 42% of the child population is malnourished. This inequality is a rising problem for India. With annual GDP growth rates upwards of 8% and with the poverty only falling by 1% there remains a significant challenge in bringing prosperity to the bottom of the pyramid, that if not addressed in an appropriate timeframe could yield social unrest. In this excerpt, Shashi Tharoor outlines the future economic progress for India and the opportunity it represents for pulling people out of poverty. To see complete interview with Shashi Tharoor click here. Similarly, Gurcharan Das, former CEO of Procter and Gamble India and noted consultant and author, presents a bullish overview of India’s economic future and compares it to China. Hint: To better view ^ the presentation click the full option on Slideshare. Both Tharoor and Das discuss the significant potential that this economic gain will have on bringing the bottom 300 million out of poverty. Noted academic C.K. Prahalad also suggests that focusing on the bottom of the pyramid can be a win-win solution for both customers and the enterprise. This book was created based on a paper that Prahalad and Hart published in Strategy + Business in 2002. You can read the paper by clicking here. 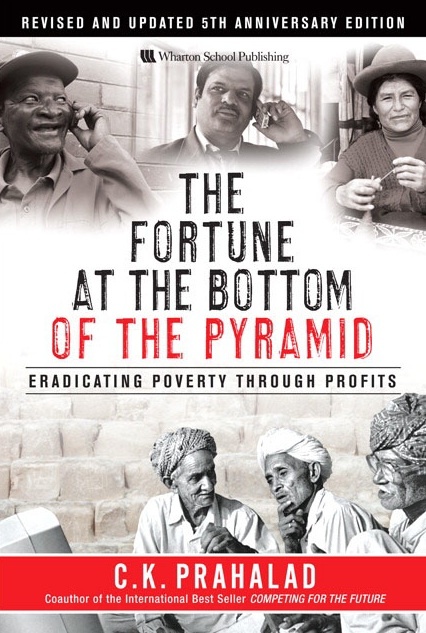 In the following video excerpt, Dr. Prahalad outlines three false assumptions we make that impede us from seeing the opportunity that lies at the bottom of the pyramid. In video excerpt, Cyril Shroff outlines the history of India’s Economy from being a Basket Case at the outset of Independence to becoming the a key player in today’s World Economy. To view the complete interview with Shroff click here. In a similar vein, Nandan Nilekani outlines here why India was initially reluctant to embrace globalization but not that the reforms of the 80s and 90s have taken hold globalization is widely accepted in India. To view complete interview with Nilekani click here. In both cases, Saroff and Nilekani highlight that the India initially turned its back on globalization in favor of more socialist reform. With the arrival of Economic reform in the 1980’s/1990’s India has grown significantly, but this growth does not come without significant challenges. In this video excerpt, Edward Luce, emphasizes the fact that that the disparity between rich and poor presents to India is a significant challenge and can be attributed to the inefficiency of the Indian state. In this excerpt, Cyril Shroff explores the widening poverty gap and the challenge that the government faces in closing it. How has the caste system contributed to the ongoing (and perhaps widening) disparity between rich and poor? What is it about Indian society that enables it to be so tolerant of religious equality and economic disparity? Why have the economic reforms of the 1980s and 1990s not been successful in reaching the bottom 300 million? Consider the tension of a country with 8% GDP growth with poverty only falling by 1%. How can a parliamentary system with a 24 party coalition government implement rapid reform to address this gap?